Eight policemen killed, 37 wounded. This is the outcome of the armed clash between law enforcement and an armed group which happened on Saturday, 9th in the city of Kumanovo, in the north-east of Macedonia. According to the authorities, also 14 members of the group allegedly died, while over 30 surrendered to the police special forces. Fortunately, there are no civilian casualties, but the media report of huge material damage. For over 24 hours, the neighbourhood of "Divo Naselje" in Kumanovo turned into a battlefield, with entire families helped by the police to flee the clashes and helicopters flying over the city. The entire neighbourhood was evacuated and only on Sunday evening were citizens able to return to their homes. The whole area is scarred by the shots , while the smell of gunpowder becomes even stronger. The government declared two days of national mourning in honour of the policemen killed, all members of the special anti-terrorism unit. That day, at least ten hours passed after the start of the clashes before the Interior Ministry resolved to give the public some information. Police officers spoke of "a group of 50-70 well-armed terrorists", entering Macedonia "from a neighboring country" with the aim "to destabilize the state by attacking strategic objectives, both institutional and civil, in Skopje and other Macedonian cities". On Sunday 10th, at the end of the operation, the police released a video showing some members of the armed group after the surrender. Some of them wore signs leading to the National Liberation Army (known as the Macedonian KLA), a group related to the Kosovo Liberation Army, active in the armed clashes that in 2001 brought Macedonia on the brink of civil war between the Macedonian and Albanian parts. According to the Ministry of the Interior, leaders of the armed group allegedly include historical names of the KLA – Muhamed Krasniqi (known as commander "Malisheva"), Mirsad Ndrecaj ("Commander Nato"), Sami Ukshini ("Commander Sokoli"), Beg Rizaj ("Commander Begu"), and Deme Shehu ("Commander Juniku"). On that same day, a message signed by the KLA appeared on the media claiming responsibility for the attacks, stressing that these must be seen as part of the struggle for the creation of a large Albanian state. On Sunday, Prime Minister Nikola Gruevski also addressed the country. "This is not a conflict between Albanians and Macedonians, but between those who seek to harm the country and those who try to protect the state and its constitution", he said. Yet, after the worst armed incident in recent years, many questions remain open about what happened in Kumanovo, especially about the root causes that led to the clashes. The hypothesis that the battle of Kumanovo is part of the struggle for "Greater Albania" is supported by several considerations. The Macedonian UCK also claimed the recent operation in the village of Goshince, near the border with Kosovo, which took place on April 21st, when a group of about 40 armed men attacked the local police station and took control for a couple of hours, holding hostage and beating up the local police officers. The group then recrossed the border with Kosovo. The National Liberation Army has also claimed other violent incidents (explosions near police stations, launching grenades at public buildings etc.) between October 2014 and May 2015. Albanian politicians in Albania, Kosovo, and Macedonia often refer to the so-called "Greater Albania" or "natural Albania", although often from minority positions. In an interview for OBC, anthropologist Armanda Kodra from Tirana warned that "nationalism has never disappeared from the Albanian public discourse, but it has become more intense after the proclamation of independence by Kosovo". According to Kodra, politicians recklessly use this fact for their narrow interests. If adding to this the recent statements by Albanian Prime Minister Edi Rama on the "inevitable union between Albania and Kosovo", within or outside the EU, it is clear how the battle of Kumanovo is read by many in the frame of the Albanian nationalist and irredentist struggle. However, a second reading supported by various experts has gained ground in recent days, especially on the opposition media. According to this version, the clashes in Kumanovo would actually be an "inside job", an accident programmed to distract the public. The main beneficiary of such distraction would be the current government (a coalition between VMRO-DPMNE and DUI), given the huge wiretapping scandal that has shaken the country and the subsequent protests. Other theses point to unspecified foreign intelligence services, with Macedonia's participation in transport projects of Russian gas to Western Europe mentioned as a possible motive. The inside track, however, is the most discussed. On Tuesday, May 5th, thousands of citizens protested in front of the government premises in Skopje to demand the resignation of Prime Minister Gruevski and the cabinet following the wiretapping scandal. Drawing on conversations made public by the opposition party of Social Democrats, members of the government would be involved in an attempt to cover-up the killing of 22-year old Martin Neskovski, beaten to death by a police officer in June 2011. The event, peaceful at first, turned into a clash between the citizens and the police. After protesters threw eggs against the government building several times, just before midnight the police intervened to stop the demonstration. In the riots that followed, both policemen and protesters were injured, while about 30 people were arrested. Former MP and political analyst Mersel Biljali, in a statement to the information portal BIRN in late April, declared that the failure to quickly resolve the political crisis created the risk that someone could pay small criminal groups to stage an ethnic conflict. "Albanian criminal groups can be used to attack Macedonian villages, or vice versa", repeated Biljali shortly after the attack to the Goshince police station. Retired general Ilija Nikolovski, a protagonist of the clashes between the Macedonian army and the KLA in 2001, stated in an interview with TV channel "Kanal 5" that today's situation has nothing in common with what happened back then. According to Nikolovski, the conditions are not in place for the clashes in Kumanovo to turn into a wider conflict. "It is in the interests of the Albanians, regardless of the state they live in, that the region is stable, peaceful, and that they are not held up as 'the usual suspects' behind conflicts and instability in the Balkans". A few weeks ago, another retired general, Stojanche Angelov – who was also involved in the 2001 clashes – publicly stated that someone, not better specified, was trying to provoke ethnic clashes with the help of criminal groups. For this purpose, said Angelov, about two million Euros would be paid. 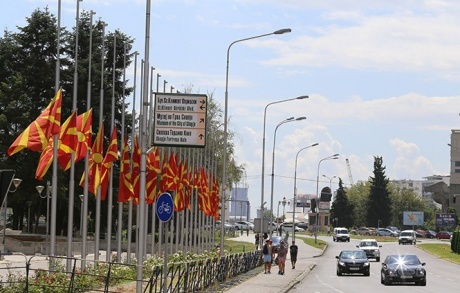 While serious concerns and invitations to peace are raised at the European and international level, Macedonia tries to come to terms with the consequences of the clashes in Kumanovo. On the table there are many conspiracy theories, unverified, news and pure disinformation. Yet, incontrovertible facts remain, such as the death of 8 policemen (including one ethnic Albanian), 14 terrorists (or mercenaries? ), the injured, the damage, and the panic among Macedonian citizens, regardless of ethnicity. At present, however, the attempt to divide people has not succeeded. There are no signs of ethnic divisions or attacks against "the other". A video showing a citizen of Albanian ethnicity from Kumanovo asking for peace, solidarity, and political responsibility in an interview with TV channel "24 Vesti" has become viral, collecting 400,000 visits and 15,000 shares on Facebook in less than 8 hours. A small, yet important sign of hope that Macedonian society today has the antibodies necessary to avoid being dragged into violence.